I had never heard of 1080p24 or even conceived that it might be possible. But how on earth does it avoid flicker, the bane of all TVs and early computer displays? And just what kind of display device do you need to display 24 fps? Presumably the answer has a lot to do with how flat panel devices can be made to work. Flicker is not a problem with modern digital displays. Flicker occurs on scanning displays, like CRTs, because they rely on the persistance of output from the phosphors on the screen after the scanning electron beam has passed. A slow frame rate leaves too long an interval before any given pixel is refreshed, so you get flicker. Digital displays hold all the signal data in memory until a full frame has been collected, and then switch this instantly to the display. This is then held on the display while the memory fills up with the next frame, and then this is shown. Whether any given frame has to be held for 1/24, 1/50 or 1/60 of a second doesn't matter, because there is no fading between frames. I used to run my old computer CRT monitor at 85 hertz (the highest it was capable of at the resolution I was using) to avoid flicker. My new LCD monitor only runs at 60 hertz max, but there is no flicker at all. It could probably run at 10 hertz without flicker, if it were so specced, and still meet my needs, except for DVD playback. I've been reviewing a lot of subwoofers lately and for almost all of them the manufacturer quotes two power specifications for their built-in amplifiers: the continuous output power (sometimes erroneously labelled 'RMS'), and 'dynamic peak' or similar words. The latter is typically double or more of the former. Some claim that this is a truer representation of what a subwoofer amplifier will deliver in the usual course of business. This is a reasonable argument, or would be if we had some sense of how it was actually measured, and whether it is measured the same across the industry. But what's this about 'center-to-peak'? When you're doing power output measurements, you do indeed measure the voltage, and the centre to peak is the easiest to measure on a CRO. You couldn't really use an RMS voltmeter because the offs would be averaged with the ons. Last night I was playing a CD of The Who's Tommy, and things were very peculiar with the sound. The kick drum seemed to be quite out of time with the rest of the music, and there seemed to be a mid-bass lumpiness that shouldn't have been there. I was using small Krix speakers and a Krix subwoofer, and in my experience Krix stuff is pretty good. So what could be going on? I plugged in a pair of headphones and the bass kick seemed back in place, so it wasn't something weird on the CD that I had previously failed to notice. Maybe, I thought, I had the distance setting on the subwoofer in the home theatre receiver set too high. I even started to adjust it (I normally put it at 3.6 metres, compared to the 2.7 metres for the front speakers). Then I realised that at a delay of just 3 milliseconds per metre, this really wasn't going to make much difference. But this did get me thinking along the right lines. A week or so ago I was using some video gear that seemed to insert a significant delay to the video, to the point where there were lip sync issues with some material. I'm not especially sensitive to lip sync issues, so it must have been marked for it to be disturbing to me. But, it turns out, this was operating weirdly. I have my own front speakers set to 'large' in the receiver's setup, but the Krix speakers needed to be set to 'small'. That caused the receiver to extract the bass, as it should, and send it to the subwoofer instead. But it seems that the group delay does not operate on the bass sent to the subwoofer, so it was leading the rest of the sound by 80 milliseconds, or nearly a tenth of a second. I zeroed out the group delay and everything sounded as it ought to (including eliminating the mid-bass lumpiness). Below, my blog entry 'We need a videophile's High Definition Digital TV Receiver' puts the case that we are not getting all the picture we should be with standard definition digital TV, thanks to what I suspected was poor deinterlacing in the receiver. Last night I found a way to test this directly, thanks to some advice from Marcelo, a very helpful participant on the DBA forums. I've been testing out the DVDO iScan VP50 video processor. In fact, I'm about to write it up. This entry isn't about the VP50 particularly, other than to note that this is about the most powerful bit of home entertainment kit I've ever seen. Instead, it is about something that VP50 revealed. One of the VP50's many excellent features is something called 'Prep'. You can select this when the processor is being fed a progressive NTSC or PAL signal (ie. 480p or 576p). Prep causes the VP50 to un-deinterlace the video, restoring it to its original 480i or 576i. Why? Because many source devices do a very poor job of deinterlacing. By restoring the signal to its original condition, the VP50 can then apply its own high quality deinterlacing. So here's what I did. The other night I recorded the Cricket World Cup final on a Strong SRT-5490. Watching cricket has been a uniformly poor experience over the years, especially on a big screen. Quite aside from any deinterlacing problems, the multiple MPEG2 encoding/decoding sequences between the cricket ground and my home leave significant compression artefacts visible. Last night I played this back and fiddled with the various processing options. I was using a BenQ 1080p DLP projector to view the picture, with its aspect ratio set to 'Real' (this invokes 1:1 pixel mapping) and the output of the of the VP50 set to 1080p. The Strong does not have an automatic video output mode, in which the output resolution matches that of the signal. So I normally leave it set to 1080i output, so as to get the best picture with the HD channels. I focused my camera on the 'WIN SPORT' logo at the top right hand of the screen and took three photos of this. The first was with the Strong outputting 1080i. The second was with the output of the Strong set to 576p, and with the VP50 'prepping' the signal back to 576i, and then re-deinterlacing it properly. The third was with the output of the Strong set to 576p, but with 'Prep' switched off in the VP50. The picture to the right shows the result of this. I can say that these photos accurately represent what I saw on the screen. They aren't just artefacts of a snapshot. Let us start with the bottom one: 576p output from the Strong, no processing (other than scaling) by the VP50. As you can see, the letters are quite fuzzy. That is because the Strong (and most other devices, other than those with high quality processors from Faroudja or Silicon Optix) deinterlace material by showing in sequence each of the two fields that make up the frame. 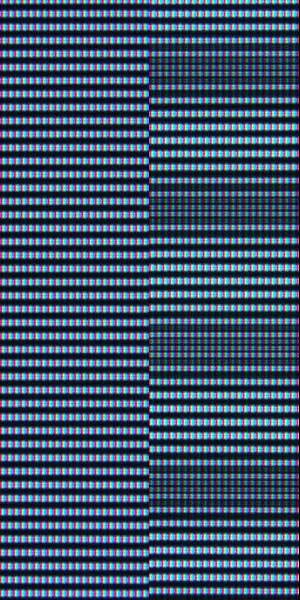 That is, one 576 line frame is delivered by first showing the 288 lines of one of the fields (the other 288 lines are filled in by interpolation) while the other 288 lines are shown a fiftieth of a second later. This manifests as fuzziness (largely due to the interpolation) and loss of fine detail (see the cross-bar of the 'T'). This process is called 'bobbing', and it isn't too bad. But a better process is employed by the likes of Faroudja and Silicon Optix and, of course, DVDO. This goes under various names, but the essence of how it works is this: the processor identifies which bits of the picture are actually moving by comparing the two frames. It still bobs those parts, but any parts of the picture which are stable it 'weaves' together, as though it were a progressive scan picture. Since the 'WIN SPORT' logo wasn't moving, the VP50 rendered it at full resolution. So what? you ask. After all, that 'SPORT' bit shown on this pages is just one hundred display pixels wide ... out of 1,920! The actual cricketers were still bobbed. Well, there are two ways in which this makes an improvement. In much interlaced TV there is enough stable detail, which is sharpened up by this processing, to make a real difference to how sharp the overall picture appears. It is much, much more restful on the eyes. The second way concerns material which is not interlaced, such as most drama, movies and so forth. The Strong bobs all of this as well (I confirmed that this afternoon, noticing bobbing artefacts on a film I had recorded on the Strong). But the VP50, with Prep switched on, sharpened up the picture slightly, and eliminated all those artefacts. What have I forgotten? Oh, that's right: the top part of the picture! You know, the one delivered by the Strong at 1080i. Well, all that shows is that the Strong's scaler from 576i to 1080i is total crap. This is something that I will be paying very close attention to in the future. The issue before last of Sound and Image magazine carries my article comparing the picture quality of SDTV and HDTV. In brief, I captured snippets of both versions of the same programs on a high definition PVR (the Strong SRT-5490), downloaded them to my computer, then took a number of matching frames for the comparison. The article came out quite nicely, I thought, but in the translation of the stills to the printed page, I thought the differences weren't quite as clear as they were on my computer screen. With my similar article in the current issue, with Blu-ray vs DVD, the differences in the comparison shots are a lot clearer. Anyway, I've placed the whole article, complete with the comparison photos, here: Standard Definition TV vs High Definition TV: Is the latter really better than the former? Last night I started working on a blog entry on this subject, but soon after I started I realised that I was putting in too much work to just give it away. So this is just a brief taste. Full details will be in a forthcoming issue of Sound and Image magazine. The picture to the right consists of details from two closeup photos I took last night of a 1080p LCD display. In both cases I was feeding a 1080p test signal from a DVDO iScan VP50 to the display. The test signal was alternating black and white lines for the entire 1080 line height of the picture. The picture on the left shows the excellent result achieved when I enabled 1:1 pixel mapping in the display. The picture on the right was with the default setting of the display, which scaled up the picture slightly. Obviously one is far more accurate than the other. In the article I have used a analogy of the 'beat', the cyclic volume variation when two notes are played which are very close to, but not quite exactly, matched. That led to a discussion with my editor of the differences and similarities between the auditory and visual worlds. Naturally I had some thoughts on the matter. Both musical beats and the display example in the photos just come down to interference patterns. You could make the reverse analogy and say that a beat generated by two slightly mismatched tones is actually an aural moire pattern. However in the visual field the effect is far less obvious than the musical field. It's amazing how much rescaling and conversion of video that can take place with remarkably little impact on the picture. Try to do to music the stuff that we do to video, and it would sound like crap. I think its because of the differences between the ways our eyes and ears work. The latter do divide sound up into several frequency ranges, with different parts of the ear responding to different bands, but in the end it is all woven together and we get a seamless capture of up to ten octaves. Our eyes only have a range of one octave, so that immediately rules out doing anything artistic with light in a way akin to music. It's the coincidence of harmonics that makes musical harmony work: the second harmonic of C is almost identical to the first harmonic of G -- there is just 0.89 hertz difference between them for Middle C and the G above it, and if you listen carefully you can hear the slow beat; and there is 1.18 hertz difference between the third harmonic of Middle C and the second harmonic of the F above it. The other difference is that our eyes treat brightness and colour very differently. It is colour, of course, that is the equivalent of tone in sound. But we do not see a continuous spectrum of colour in the way that we hear a continuous spectrum of sounds. There are three colour bands, and all the light frequencies near to the centre point of one of those bands are lumped together and captured by just one of the three types of pigmented colour receptors in the eye. What our brains tell us is a smooth range of colours is actually the results of mixing three levels of response from the three types of receptors to three bands of frequencies. In fact, you can take two sets of three frequencies, and if the levels are adjusted correctly, you can make them both look the same, although they would measure very differently with a suitable instrument. The Public Enemy (1931), a very important James Cagney movie.